IRELAND IS PLACE OF TALES AND LEGENDS, BOOKS AND ART, COMICS AND CELTIC MYTHOLOGY. Ireland’s literary tradition includes Gothic writers such as Sheridan Le Fanu, Bram Stoker, Regina Maria Roche, and Charles Maturin, as well as fantasists such as Jonathan Swift, C.S. Lewis, and Edward John Moreton Drax the 18th Baron of Dunsany. Today, writers including Michael Scott, C.E Murphy, Ruth F Long, Celine Kiernan are continuing Ireland’s fantasy tradition. Irish contributors to the science fiction field include James White, Bob Shaw, and Ian McDonald writing in English and Cathal Ó Sándair writing in Irish. From W.B. Yeats to Oscar Wilde, Flann O’Brien to Elizabeth Bowen, much of the work of Irish writers has been suffused with the fantastic. Ireland has always attracted those with literary genius from beyond its shores. 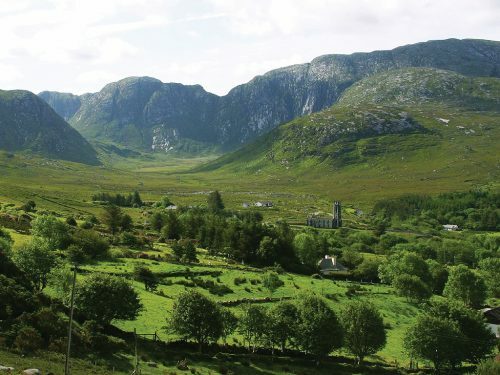 Harry Harrison and Anne McCaffrey both made Ireland their home, while Morgan Llywelyn spent part of her childhood here and has lived here for more than 25 years. Ireland has had fantastic children’s work from Sinéad de Valera, Eoin Colfer, Kate Thompson and Darren Shan, and in comics, storytellers and artists include Garth Ennis, Michael Carroll, Will Simpson, John McCrea, Declan Shalvey, Will Sliney, Stephen Mooney, and Maura McHugh. Filmmaker Neil Jordan and playwright Conor McPherson are Dublin born and bred, as are the artists Jim Fitzpatrick and Harry Clarke. The academic tradition has also been represented by the likes of Ella Young, who was a professor at Berkley in the 1920s on celtic mythology, and more recently by scholars like Aphra Kerr, who examines videogaming and players. If you are interested in finding out more about the SF/F/H horror tradition in Ireland, we run a weekly ‘Irish Fiction Friday’ on our Facebook page. Every week this links a free piece of writing from an Irish author or creative, from Sarah Rees Brennan to George Bernard Shaw.